To no one’s surprise, Beef Products Inc. (BPI)—maker of the ground beef product that took on the moniker of "pink slime"—filed a defamation lawsuit earlier this month against ABC News and several individuals. Consumers were outraged to learn their beloved hamburgers contained what some claimed was previously used as dog food. As a result of the massive backlash, several large grocery chains stopped using the product, and eventually, (so the company claims) BPI was forced to shut down several facilities and lay off hundreds of workers. 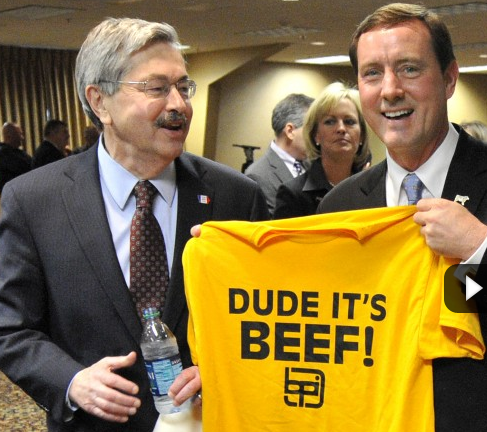 The gallant (and appalling) display of political muscle that included three governors, a website to get out “the facts” (beefisbeef.com) and even a “Dude, It’s Beef!” t-shirt just weren’t enough to stem the tidal wave of angry consumers who didn’t want the product in their burgers. But isn’t this how the market is supposed to work? When consumers decide they don’t like your product, maybe your company should reconsider its business model to conform to the marketplace? Funny how when the market responds in the way capitalism intends, and in this case, without any pesky government regulation, industry’s response is to sue somebody, aka shoot the messenger. The purpose of the ABC Defendants’ actions was to grow the so-called “grassroots” movement against LFTB [lean finely textured beef] that they created themselves. The ABC Defendants knew that consumer pressure would force many of the chains to decide to stop selling ground beef with LFTB. Indeed, the “grassroots” movement created by the Defendants’ disinformation campaign was successful. The major grocery store chains had little choice but to respond to the consumer backlash, and they did so by canceling or suspending future orders of ground beef made with LFTB. But the complaint offers no motivation that ABC News would have to “grow” such an anti-LFTB movement. And if the grocery stores had no choice but to respond to consumers, how is that the defendant’s fault exactly? While they’re at it, why not sue the consumers for “interfering” with BPI’s contracts (another silly claim in the complaint)? Despite the issue being reported by numerous media outlets at the time, the target of this lawsuit is clearly ABC News. In addition to the company, the suit names World News Tonight anchor Diane Sawyer, Senior National Correspondent Jim Avila (who bravely stayed with the story) and correspondent Dave Kerley. Also named are two former USDA scientists, Zirnstein and Carl Custer, along with ex-BPI employee turned whistleblower Kit Foshee. (I wrote about Foshee’s dramatic presentation at a food safety conference last year while BPI executives kept a close watch in the audience.) All three of these defendants, made relevant comments elsewhere, but are cited mainly for the statements they made on ABC News broadcasts. The suit also claims that ABC should have known these three were not reliable experts. Carl S. Custer, a former U.S.D.A. microbiologist, said he and other scientists were concerned that the department had approved the treated beef for sale without obtaining independent validation of the potential safety risk. Another department microbiologist, Gerald Zirnstein, called the processed beef “pink slime” in a 2002 e-mail message to colleagues and said, “I do not consider the stuff to be ground beef, and I consider allowing it in ground beef to be a form of fraudulent labeling." Pretty damning stuff. So why didn’t BPI sue the New York Times in 2009? Reporter Michael Moss cited the same (supposedly unreliable) experts ABC did. But, of course, the Times story didn’t cause a massive consumer backlash. Considering how the ABC reports were hardly even news, combined with the broad free speech protections the media enjoys, BPI’s lawsuit seems pretty weak, as others have noted. Drake University Agricultural Law Professor Neil Hamilton told a South Dakota news outlet (the case was filed in BPI’s home state) that it will be a tough case to win, given that defamation cases are always difficult and, “… [p]articularly in a situation like this, where you are arguing food product disparagement…” ABC News will argue First Amendment protection. The case is based in part on South Dakota’s food disparagement" law, passed in 1994. While most SLAPPs lose in court, they “succeed” in the public arena. This is because defending a SLAPP, even when the legal defense is strong, requires a substantial investment of money, time, and resources. The resulting effect is a “chill” on public participation in, and open debate on, important public issues. Even the strong media force Oprah Winfrey felt the sting of being SLAPP’d, despite her winning the lawsuit. According to this recent analysis, Winfrey declined to speak publicly about the case and even refused to distribute the offending episode to journalists or anyone else who requested it. Unfortunately for BPI, no litigation can return us to the time when Americans were unaware that LFTB was in the nation’s ground beef supply. Now that they understand the nature of the product, many consumers have made it abundantly clear that they don’t want it to eat it. You can’t un-ring the bell. The intended message of this suit: Scare the media and others out of speaking out against the meat industry. This is known as a SLAPP suit, which stands for Strategic Lawsuit Against Public Participation.